There was a guy who so loved duck hunting that he chose that over playing pro football for the NFL. He invented a duck call, started a company called Duck Commander, eventually put his son Willy in charge, and that spawned a media and merchandising empire for a family of rednecks known as Duck Dynasty. This is now called the Phil Robertson way. If you are reading this article, you are probably being seen in your market as one of many businesses that offer the same service. You are being seen as a commodity which makes you have to compete on price. I believe that becoming the expert isn’t the way to look at this. I believe that you are already the expert and this is my 5 step process of being seen in your market as the go-to person. Everything is pointless if you force yourself to work in a field that doesn’t resonate with you. If you miss this step everything from this point onward is like swimming upstream. I believe that there has never been a better time to create a following around your passions. Blogging has been a great space which allowed us talk about the things we loved and we had readers follow our stories. I believe that Simon Sinek’s TED talk on “Starting with your WHY” is a great starting point. Then read or listen to the book. Everything you have done in your life until this point has gotten you to a point where you are reading this article. I know as much as you do that the experiences, ideas and resources you have are unique to you, and you alone. Whether you realise it or not, you are already an expert within that realm. It isn’t that you need to go out and get a whole bunch of degrees and certifications to prove to people and yourself that you are the expert. Think about what you do and why you would still do it. We usually never give ourselves enough credit for our past achievements or work history. We take for granted our “gold star” moments. Did you know that 68% of entrepreneurs indicated that capitalising on an original business idea was in important motivation for starting their businesses? You are already great at what you do, you just need to coherently tell yourself first, and then your customers why. That is why a platform to do it from is so important. There are so many great platforms available today. There used to be a time that you were seen as the expert if you wrote a book or to had your own television show. Even though those would definitely help, they aren’t the only ways in today’s world. You can have a very successful YouTube channel, or write a great blog. Or like in my case, have a successful podcast. Since I’ve started my podcast, there have been other platforms that have come up. Periscope and live streaming being one that really stands out. But more importantly, you’ve really got to create the platform that helps you authentically communicate your expertise to your people. Once you have your platform, which is critical by the way, you can now invite the other experts in your market to your platform. This has multiple benefits. Firstly, the other experts suddenly give you time because you have something to invite them onto. It isn’t a cold call to talk with them. And if the conversation is the only thing you get out of the experience, then it would still be worth your while. Apart from having these great conversations with the big-guns in your industry, you now have the benefit of being the expert that brings them all together around a topic that you love (see point 1). You are the collector of important information that your market will love you for. But, engaging with your people and the other experts are important. 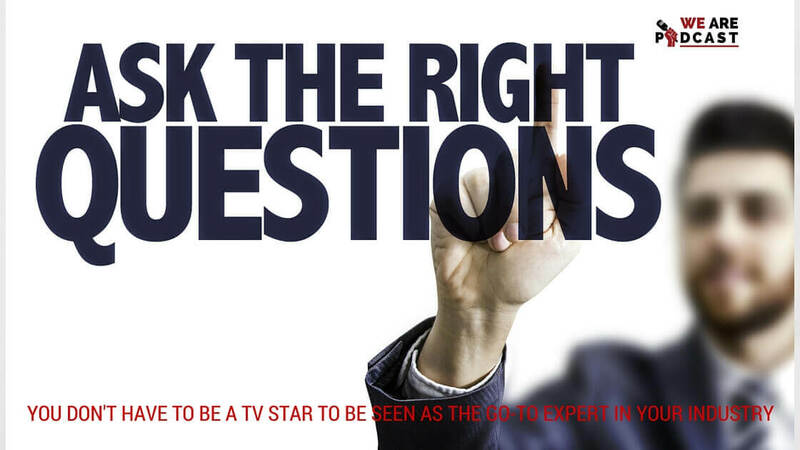 Because your are different to your competitors, you should be asking questions of the experts on your show that are different to your competitors. Ask yourself, what would my customers love to know that none of my competitors are covering. What are the hard questions that are not being asked? Be genuinely interested in what the other experts have to say. If you consider that each of the experts you invite onto your platform have their own unique experiences, ideas and resources then each conversation is going to be very unique.